Seniors by themselves are a lot of fun to work with. The bring their own individuality and personality to the session and make each image uniquely their's. When you add fellow graduates and friends to the session, it gets even better. 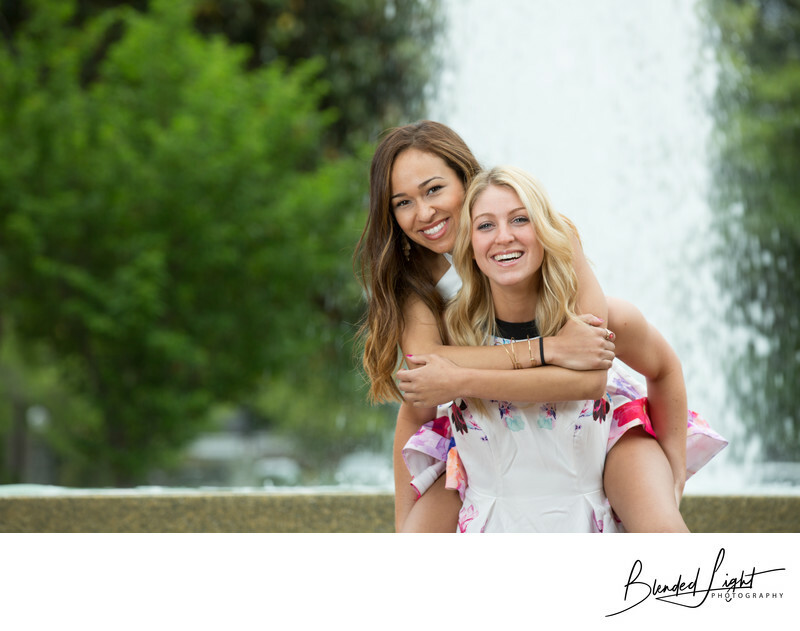 These two sorority sisters had spent basically the last 4 years together since pledging early in their freshman year, so it was only natural for the two of them to do the senior pictures together. The Fountain at ECU is a great location to cut loose a little, with many of my seniors choosing to get in it and do their champagne toasts. For this shot, they had already done the toast and were getting out, when one jumped on the others back. It was too good of a shot to pass up on it. Though I would have preferred to frame them opposite of the fountain, candid moments happen where they happen, this shot was where it was. With my off camera flash still up, I put a little light on them at a small aperture to create separation from the fountain and the background. The priceless smiles on their faces show the fun they were having with the shoot and with each other. Location: Trustees Fountain, East Carolina University, Greenville, North Carolina. 1/160; f/5.0; ISO 100; 170.0 mm.